Popular showing bit. 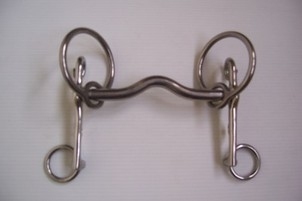 The top rein goes on the floating ring and the curb chain on to the "pigstail". The floating rings will give a squeezing action on to the side of the face. There is little poll pressure with this bit. It is quite a strong effective pelham. Comes with curb chain. Please ring us if you require this with a longer shank or with a different mouthpiece.